Autumn bird migration is starting though not obviously in full swing. A couple of Avocets, a handful of Black-tailed Godwits on the reserve at Rainham Marshes RSPB with Whimbrel roosting on one of the poles by the Thames from the visitors centre - Saturday 11 July 2015. 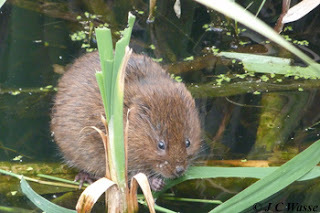 A cracking view of a Water Vole at the far corner of the northern boardwalk deserved more attention than I gave it as news broke (early afternoon) over the radio of a Lesser Emperor Dragonfly present at the Dragonfly Pond. A nice find by Jerry H. Possibly a site first? We were soon at the Pond where it wasn't on show but luckily it flew in and around us after a couple of minutes where it remained on show on and off until 13:20. One of the first looks before it established a circuit of the pond was seeing it perch briefly on a twig by the platform, observers reached for cameras and guess what, it flew off and didn't appear to land again whilst it was on show. A distinctive Dragonfly characterised by the blue abdominal segment that stood out like a lantern at most angles. In flight it did spar with a female Emperor Dragonfly and Black-tailed Skimmers. It's disappearance coincided with the larger male Emperor Dragonfly showing up. Would the male Emperor Dragonfly have shoved it off? Although it was also getting windy, could that have been a factor? My 2nd sighting of this rare visitor to the UK from Europe, having seen one in the 1990s whilst twitching a Squacco Heron in Cambridgeshire which may have been one of the first UK records? Saw several in Cyprus (Oct 2014) and Germany (June 2015). 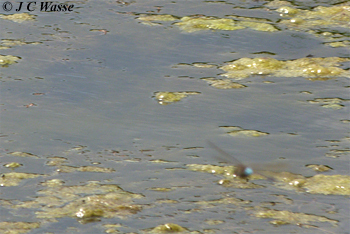 Whilst it was clearly doing a circuit of the Dragonfly Pond it was impossible to follow with the camera. I tried a couple of shots and I believe I've got a very poor record shot of the Lesser Emperor Dragonfly shown below, next to the photo of 'Ratty'.